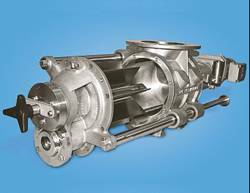 DMN-WESTINGHOUSE has been designing and manufacturing rotary valves, diverter valves and other related components for the bulk solids handling industry for more than 30 years. Offering tailor made solutions for chemical, food, plastics and pharmaceutical industries, DMN-WESTINGHOUSE products are distributed worldwide. An extensive network of subsidiaries, distributors and representatives ensures a high level of service and support all over the world. In the Asia Pacific region, DMN are represented by Singapore based RAP Engineers, whose sister company, NTR Engineers, services the Australasian market. In addition to their extensive range of standard components, the company supplies USDA accredited sanitary versions and ATEX approved explosion-proof models. The DMN-WESTINGHOUSE AL air lock and BL blow through Dairy valves have been designed for use in the food, chemical and pharmaceutical industries where very high standards apply. The construction of the valve is designed to avoid bacteriological contamination, with all product contact surfaces in food grade material and smoothly polished. The Dairy valves are available in 6 sizes covering a capacity range from approximately 2.5 to 58 litre per revolution at 100 % filling. 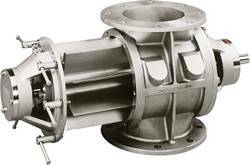 The valves have a USDA certificate of approval for use in dairy plants. The body and end covers are made from AISI 316 stainless steel (DIN 1.4408). The rotor is made from AISI 316L (DIN 1.4404) and shaft sealing can be glands or air purge. The standard models are suitable for temperatures up to 80 °C and a pressure up to 2 bar g. Flame proof and explosion shock resistant versions up to 10 bar g are also available.